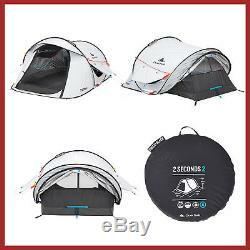 QUECHUA 2 Seconds Easy II Fresh & Black Pop Up Camping Tent - 2 Man. This tent pops up in just two seconds with very little effort required on your part, and it's easy to take down and slide inside the accompanying cover too. Fresh & Black technology keeps the interior cool and dark. Easy assembly / dismantling Free standing structure. Sleeping area 120 X 210 cm. Max useful height: 98 cm. Ø65x9 cm / 29.9 L. Flysheet, mechanical ventilation, Fresh & Black fabric for a good night's sleep. FRESH & BLACK patented exterior fabric: 99% darkness even in broad daylight. Withstands 50 km/h winds (Force 6): validated in a wind tunnel on a turntable. Waterproof Tested under a shower at 200 mm water/hour/m² (tropical rain) and field tests. Environmental impact Life cycle comparison: tent for sleeping. TECHNICAL INFORMATION Assembly/disassembly Rapid set-up. Freestanding tent you place it wherever you want once set up and, if there's no wind, you can use it with no pegs = direct use! Folds up easily thanks to the Easy guide system. Ventilation Flysheet with 2 side panels that can be extended and fixed with side guy ropes (opening from the inside). The air can circulate in the sleeping area. The entire rear sleeping area flysheet can also be lifted from the inside by pulling on a rope. 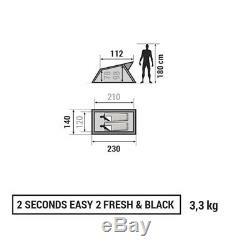 2 spaces between the flysheet and the ground on each side in the middle of the sleeping area to allow the air to be refreshed and limit as much as possible the natural phenomenon of condensation. Fresh concept reduces the sun's heat. Protection from the sun The Ti0² coated fabric has a UPF of 50 +. Warning: a large amount of UV can pass through a simple open door. Protect your skin with sun cream. Waterproofing All Quechua tents are laboratory tested (whole tent under 200 L / m² / h for 4 hours), as well as in the field. (Polyester 2000mm PU-coated flysheet, polyethylene groundsheet 120 g/m², all seams sealed with heat-bonded strips). The presence of a breathable polyester sleeping area under the flysheet prevents contact with the condensation water droplets that can settle on the inside of the flysheet. Wind resistance We test all our tents in a wind tunnel on a turntable to expose each side of the tent to the wind. A well-assembled tent with all the guy ropes properly deployed around the tent should remain habitable with a wind speed measured at 50 km/h near the ground (Force 6). A score to compare products' environmental impact The product's environmental impacts are calculated over its entire lifecycle using various indicators. Pole: 100.00% Glass - Fibre (FG) Flysheet: 100.00% Polyester (PES) Carry bag: 100.00% Polyester (PES) Groundsheet: 100.00% Polyethylene (PE) Inner fabric: 100.00% Polyester (PES) Care instructions: Rinse in clean water after use. QUECHUA tent waterproofing is approved for the whole tent under 200 litres of water/hour/sqm (200 mm of rain per hour) for 4 hours. The water column test (=mm schmerbers) only measures fabric waterproofing. Our test means we can prevent any water getting through the seams, flaps, openings, zips, etc. Wind resistance: We test all of our tents in a wind tunnel and on a rotating plate to expose each side of the tent to the wind. The item "QUECHUA 2 Seconds Pop Up Easy II Fresh & Black Camping Tent 2 Man FAST SHIP" is in sale since Monday, May 21, 2018. This item is in the category "Sporting Goods\Outdoor Sports\Camping & Hiking\Tents & Canopies\Tents". The seller is "mycosmetix23" and is located in EU. This item can be shipped worldwide.